DIRECTV Residential Experience. We’ve been talking about it for over a year. To date, over 1,000 hotels have installed DIRECTV receivers and DVRs into guest rooms, giving the best quality HD picture and hundreds of channels to each hotel guest. Yet, 97% of hotels still don’t have DIRECTV Residential Experience (DRE) and it’s not because they haven’t wanted it. DRE is easy enough to build into a new hotel, but what about existing hotels? While DIRECTV has worked to keep equipment prices down, there has been one hurdle that’s been impossible to cross — the hotel’s existing wiring. Almost every hotel in existence is wired the same, and that wiring scheme isn’t compatible with DRE. That means a whole-hotel rewire, with costs running into the hundreds of thousands of dollars. That, as they say, is a lot of cheddar. Or at least that hurdle was impossible to cross. New technologies from DIRECTV will make it possible for practically all hotels to enjoy DIRECTV programming, even on older wiring. Problem solved. Let’s take a look at the new DRE system and how it works. This document is available in PDF format! Download it now! It looks like an unassuming piece of grey metal but this is the heart and soul of the new DRE platform. Behold the new DSWM13 multiswitch. It’s a Single Wire Multiswitch (SWM) like you may have at home but it has a lot more capability. Unlike the previous generation SWM, it has the power to use existing wiring, even old RG59 wiring, to deliver 13 receivers on a single run. Previous generation SWMs required a wire from the closet to every receiver… not this one. With this device you can go 300 feet on a single “loop-through” run that is already in place in the walls. That opens up DRE to every hotel with existing wiring and it means that a lot more hotels will want to take advantage of this technology. “Loop-through wiring” is the really new part of the DRE system and it’s completely different from the way that any existing DIRECTV system is wired. DIRECTV was originally designed for homes where it is fairly easy to feed wires wherever you need them. On the other hand, hotels are built to a much more industrial standard and there may not be room for all new wires. Where “home run” wires were fine for small installations a bundle of wires can get awfully big if you need to run one wire to each of 3,000 rooms. What is “home run” wiring? Home Run wiring means that there is a direct cable run between each receiver and the equipment closet. In the case of SWM technology, all wires are run to a single splitter and there can be no more than 8 receivers on a single splitter. Home run wiring makes it possible for each receiver to get a strong signal even if other receivers have broken lines. This is important in a home where people sometimes drive nails through in-wall cables or bend cables to the breaking point. The easiest way to imagine loop-through wiring is to think of Christmas lights, where one wire strand goes from end to end and lights branch off the wire every few inches. Unlike Christmas lights, commercial loop-through installations don’t go down just because one receiver breaks (like a broken Christmas light) but a break in the line does affect all receivers beyond that point. That’s not as much of a concern in commercial installations where the wires are shielded and run through special conduits that keep them away from clumsy homeowners and pests. 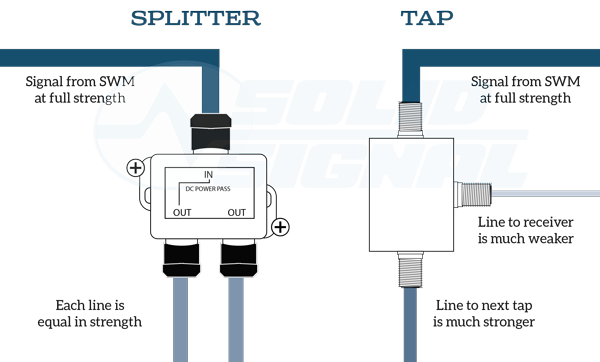 While home run wiring uses splitters, loop-through wiring uses taps. A tap is a special kind of splitter where the signal isn’t split evenly. 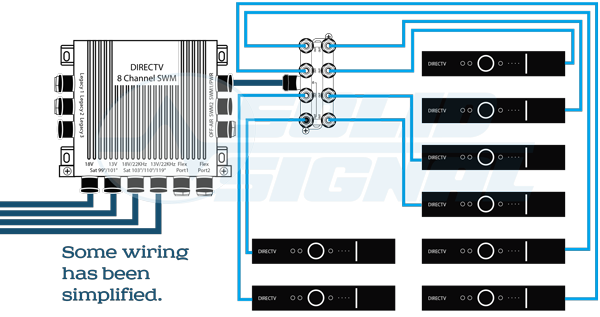 In a typical 2-way splitter, half the signal goes to each output. In a tap, most of the signal goes to the “loop-through” port which continues on to another tap, while the “tap” port gets just enough signal to power a receiver. There are two benefits to using taps: first of all a single wire can run many receivers, simplifying cabling. Second of all, the signal running from tap to tap can be much stronger without a concern that the receiver will overload. Cable TV systems and traditional headends have used loop-through wiring for years. Their strong signals make it possible to use cheaper cable and simpler wiring, which becomes more and more important as a system gets larger and larger. Because DIRECTV started out in homes as very small, simple systems, it was better to use home run wiring. However, with the new DRE system, home run and loop-through wiring can both be used to make the best possible system! The coolest feature of a DRE system for a hotel owner is the ability to control the receivers remotely. When a guest leaves, the receiver can be reset, wiped clean and made ready for the next guest. A central computer can also monitor all the receivers, hopefully detecting problems before they affect the guest. This has always been easy for DIRECTV to do, but it’s gotten even easier. Using the latest generation of network hardware combined with the DSWM13, each port on this network switch can be used to monitor 13 receivers at once. (The previous generation hardware only allowed for 8 receivers on each port.) This means that you can use fewer network switches and fewer network adapters, driving down cost. It also means that it’s possible to put 169 receivers on a single network switch that controls the entire system. This new technology eliminates two costly network switches and a lot of wiring and means that if you have a central wiring closet that is no more than 300′ from all the rooms it serves, you don’t need any other auxiliary closets. This is important in hotels built before computers and cable TV came in, because those older hotels usually don’t have a lot of space for wiring. Here’s a diagram of a typical DRE system serving 169 receivers. You may be asking yourself why you should care about the TV experience since people have smartphones and tablets. It’s true that there are more and more entertainment options that people use while vacationing, but an evening of TV is still a restful way for people to unwind after a day of sightseeing or a full slate of meetings. Adding satellite TV is actually less expensive than overhauling your on-property wi-fi system, which is probably overloaded by those very same smartphones and tablets. Making people rely on their own cellular data plans isn’t very hospitable and it might not even be an option if your area doesn’t have really robust LTE coverage. By adding the DIRECTV Residential Experience, you show your guests that you’re a top-notch property with all the latest amenities and you give them the entertainment options they want. First, a detailed site survey is done. If existing wires are going to be used, it’s important that we know where they go and if there are any “surprises” hidden in the walls. Signal Connect technicians will review every inch of your property’s wiring to make sure it meets our requirements. Special equipment will find “invisible” equipment hidden behind walls and moldings. Then, your Signal Connect representative will create your proposal. You’ll get to price out programming packages and equipment, and you’ll be able to know if there’s any need for additional electrical services on your end. Once you’ve made your choices, all the technical details are sent through two more levels of approval within the DIRECTV organization to make sure nothing has been left out. We want you to have the best system possible. When all the proposals are accepted, your system will be completely built and tested at one of our facilities. Teams of technicians will prepare every receiver, every computer and every interface to make sure that everything works properly before anyone shows up on your site. 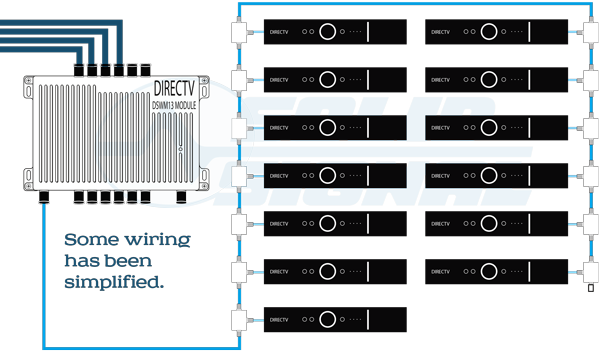 Finally, on installation day, your existing wires will get all new DIRECTV-approved ends and taps to give you the best possible picture and sound. If you have requested an interface to your property management system (PMS) it will be done while a tech is aligning your satellite dish and delivering receivers to rooms. Finally the system will be tested completely on site and you’ll be ready to go! 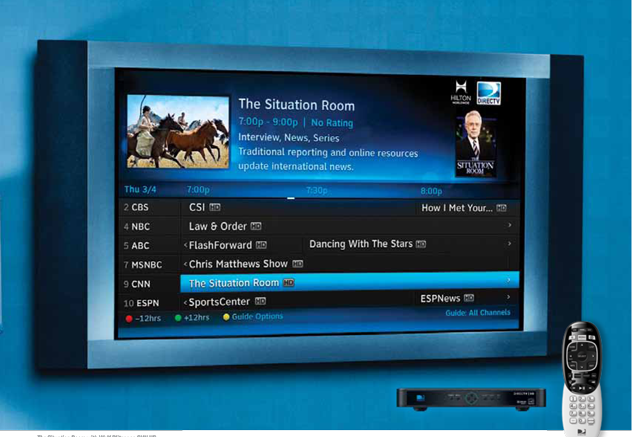 When the installation is over, your customers can enjoy the same quality DIRECTV programming they enjoy at home!